Military Leadership Lessons for Public Service. Charles Szypszak. Jefferson, NC: McFarland & Company, Inc., 2016. The new presidential administration includes more veterans in cabinet-level positions than any administration in recent memory, a point that has sparked debate among public policy experts. On one hand, Daniel Benjamin, a professor at Dartmouth College and former official at the State Department, says former military officers in civilian positions is “a matter of deep concern,” because “Generals as a rule believe in hierarchies and taking orders…Generals have one set of skills, and diplomacy is not in the top drawer of that tool kit.”[i] Senator Ron Johnson (R-Wis.) disagrees and contends, “The United States military…produces real leaders, people who know how to solve problems and take a very structured approach in doing so.”[ii] In Military Leadership Lessons for Public Service, Charles Szypszak explores the principles and methods of military leadership and argues they are effective for public service. [iii] Szypszak’s book will be especially valuable to service members who are interested in post-military public service, from the policy-making level to service in city and county governments. Charles Szypszak is an attorney and professor of public law and government at the School of Government at the University of North Carolina at Chapel Hill. His previous experience includes positions as the director of a law firm, an adjunct law professor, a law clerk, and a captain in the U.S. Marine Corps. [iv] Szypszak’s extensive service in law and public policy, coupled with his prior military experience aid in establishing his credibility on these topics. Szypszak begins his book with the premise that “what makes someone a good leader in the military is what makes someone a good leader in public service.”[v] The preface discusses how public policy experts, scholars and political leaders are often skeptical of—or even hostile to—the application of military leadership skills to public service. This negative perception usually exists despite little personal experience or connection to the military from among its detractors. These critics deem military leadership experience a non-transferrable skill, except in limited cases during crises. [vi] Szypszak works to dispel this skepticism in two ways. First, he shows how military leadership principles are not wholly divorced from public service leadership principles. Second, in the areas where the two leadership styles diverge, Szypszak argues why he thinks military leadership is superior. Over the course of four main sections, Szypszak discusses: 1) the widening gap between military and public service leadership, 2) the differences in how the two different kinds of leadership are taught, 3) case studies of military and civilian leaders in action, and 4) military leadership methods and traits that civil leadership should adopt. He finishes the book with a list of his “immutable leadership principles,” which are values he believes all leaders—civilian and military—should adopt. Veterans in public administration leadership classes tend to be older than their counterparts and more likely to have had significant direct leadership experience. [ix] Veterans can relate to leadership challenges such as “an uncomfortable conversation with someone who is not performing, choosing between costly alternatives with real costs, or regaining trust when something has gone wrong.”[x] This book can help prepare these veterans to leverage their practical experience in the theory-based realm of public administration leadership studies. Public service leadership programs, in turn, can create better leaders by leveraging their veterans’ expertise to assist those who lack hands-on experience. The book examines leaders who were effective (or not) under extreme conditions, including Lieutenant Colonel Joshua L. Chamberlain at Gettysburg, Mayor Rudolph Giuliani in New York after the World Trade Center attacks, and Mayor Ray Nagin and Lieutenant General Russel Honoré in the wake of Hurricane Katrina. While the case studies are instructive, they seem out of place compared to the book’s other three chapters exploring the gap between military and public service leadership, how the different methods are taught, and the concepts that should be common to both. This chapter may have been better suited as a case study appendix to the main book. Regardless, the underlying point is essential: All leaders—military and civilian—must prepare themselves to lead under the worst of circumstances. The military relies on some leadership methods that are not necessarily common in public service, but could be useful in that arena. The book’s last chapter discusses approaches unique to the military, such as blunt feedback and the necessity of developing subordinates to take one’s place at a moment’s notice. While these approaches are certainly the public ideal espoused by the military, Szypszak could have been more careful to emphasize that their application is often subject to individual personalities. Across the nation, thousands of federal, state, and local government workers will retire soon. Government agencies are not prepared to replace these workers, and are in jeopardy of losing their ability to serve the public effectively. [xi] Veterans can help meet this need, since they are more than twice as likely as non-veterans to serve in rank-and-file public administration positions. 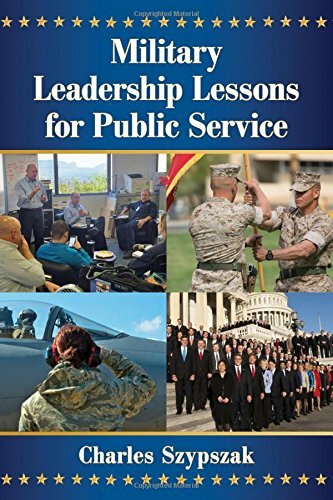 [xii] This book can be valuable for service members who desire to understand how their military leadership skills apply to other public service. [xiii] At the same time, policy makers can gain an appreciation for how their decisions on national security, the economy, and individual liberties affect service members, veterans, and their families. In many ways, military and civil roles are intertwining as the military takes on traditionally civil functions such as disaster relief, and public agencies prepare for terrorist attacks, infrastructure failure, and fight drug crimes and gangs. [xiv] It is imperative, therefore, that both military members and public service employees understand how the other side prepares their leaders and the value they can bring to an organization. Brent W. Thompson is an officer and attorney in the U.S. Army. He is stationed at Schofield Barracks, Hawaii, where he serves as the judge advocate for a light infantry brigade. His education includes a Juris Doctor from the Maurer School of Law at Indiana University Bloomington and a Master of Public Administration from the School of Government at the University of North Carolina at Chapel Hill, where he took two classes from Professor Charles Szypszak. The views expressed are the author’s own and do not necessarily reflect the official policy or position of the U.S. Army, the Department of Defense, or the U.S. Government. [i] Philip Rucker and Mike DeBonis, “Trump hires a third general, raising concerns about heavy military influence,” The Washington Post, Dec. 7, 2016, at https://www.washingtonpost.com/politics/trump-hires-a-third-general-raising-concerns-about-heavy-military-influence/2016/12/07/a6273fbc-bca0-11e6-94ac-3d324840106c_story.html?utm_term=.8f2a3604b5a9. [iii] Charles Szypszak, Military Leadership Lessons for Public Service (Jefferson, NC: McFarland & Company, 2016, back cover. [v] Ibid., prologue, (emphasis added). [vii] For further reading on the gap between the military and broader society, one should also read Warriors and Citizens edited by Kori N. Schake and James Mattis. [xi] Robbins, Christopher, “The Public Employee ‘Silver Tsunami’ Looms for Governments,” Governing.com, December 2013. Found at http://www.governing.com/topics/mgmt/gov-governments-silver-tsunami.html. [xii] U.S. Census Bureau, “How Do We Know?, A Snapshot of our Nation’s Veterans, July 2012 at http://www.census.gov/library/visualizations/2012/comm/veterans.html. [xiii] Szypszak, supra note 4, at 3.